TEXAS BOOK LOVER: Welcome to National Poetry Month at Texas Book Lover! 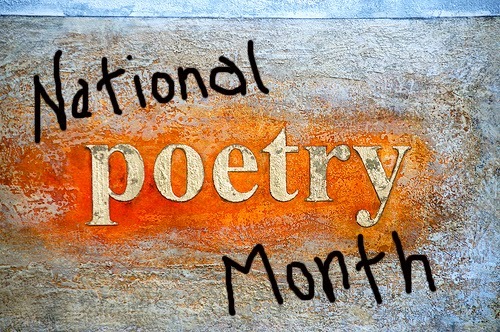 Welcome to National Poetry Month at Texas Book Lover! The dog's tongue or jock's package have left behind. Those on this table are innocent. What those on the right have been up to. That flatly refuses to take sides). While staring at his sweetly shut eyes. As if it had been for dear life's sake? Looking back, I guess I am glad they let go. Theirs are not the hands that haunt me now. A life sustained by its denials. Jutted like cairns, nails cracked and yellow. Though dead for hours, it was not yet cold. I didn't know what to do with it. Fearful of letting it go too soon. It was what - now for the last time - I first held. It was a hand. It was my mother's. Click here to listen to J.D. McClatchy read this poem. J. D. McClatchy, is a versatile and elegant poet in the line of W. H. Auden, Elizabeth Bishop, and James Merrill, who is also the editor of several dozen literary anthologies and a prolific opera librettist. A keen understanding of the operatic business of being human unites the poems in McClatchy’s Plundered Hearts: New and Selected Poems, from which we get this work, and covers a career of seven volumes so far, spanning more than three decades.